With the beginning of 2013, it is time to reflect on what Raptivity has achieved in the year 2012. It was an action packed and fun year for Raptivity. Team Raptivity tirelessly brought out some amazing stuff. There were plenty of new releases, conferences, awards and webinars. Let’s take a quick look at the activities that kept Raptivity on its’ toes in 2012. The year 2012 started with Hong Kong Open School Platform getting Raptivity. Raptivity got selected as one of the tools to power a leading education platform for schools in Hong Kong which is named "E4Learn System". This platform is an ‘e-Toolkit for teachers’ that has a learning management system (LMS) and a school-wide management system. New Releases: Raptivity announced complete support for Mobile Devices using HTML5 technology. This strategic step would offer customers with HTML5 publishing capabilities for all of its interactivity packs. The company’s Raptivity Himalaya pack would include the industry’s most extensive library of 170+ eLearning interactions for mobile devices that do not support Flash. Instructional Designers and Corporate Trainers Easily Create and Share Interactive Course Content on the new iPad. The enhanced Raptivity software made it easy for instructors to create quick and affordable interactive content that would energize students. The addition of the new Standard Pack 4 to the Raptivity product line brought in a variety of visually appealing, meaningful and expressive interactions to help organize and present complex information in a simplified yet engaging way. Raptivity Empower, a new service was launched to help organizations quickly meet their needs for developing interactive eLearning and mobile-learning courses on time and within fixed budgets. Raptivity Empower encompasses two categories of services which are Raptivity Training workshops and Custom Raptivity interaction development. In 2012, Raptivity introduced a initiative dubbed as ‘Free Interaction’. With this initiative, it will release a new interaction periodically for its valued premium customers. This free interaction will be given on a regular basis. Raptivity v7.3: With this release, the count of HTML5 interactions in the Raptivity library has gone beyond 90. The new HTML5 interactions are from the following packs: Wordplay, Mindplay, Booster Pack and Simulations. Exponential increase in demand for games and simulations in eLearning lessons have led to this effort from Raptivity which will encourage our customers to be in line with the trending times. To top it all, Raptivity support team launched a valuable portal for its premium set of customers. The portal would help customers to get information about their serial keys, the key activation status and latest updates about product along with Evolve Interactions. The customers will also be able to connect with their account manager directly. Webinars: In 2012, Raptivity had organized some great webinars. “Learning Interactions on Mobile Devices. What Works? What Doesn’t” was the first one for the year where an interactive panel discussion was held by Mobile Learning Experts. Game based learning was a favorite topic among eLearning enthusiasts in 2012 and so, Raptivity had organized a Game Show webinar on “Looking for creative ways to add fun and excitement to learning?”. In association with Power Training Inc, Raptivity also organized a webinar on how to make online training or webinar interactive and engaging for the audience. Sheri Jeavons, President of Power Presentations, Inc., a highly regarded communications consultant, dynamic speaker and entrepreneur was the key speaker of this session. Awards: Raptivity won the 2012 Readers’ Choice Awards in the K-12 category. Practicing educators along with school and college administrators had nominated their favorite educational technology product or service in the Readers’ Choice Awards program. Apart from this, Raptivity also won the prestigious Learning and Technology Impact Award for the Best eLearning Design in the Game or Simulation category, at the 2012 award program organized by LearnX Foundation. This was followed by winning of the Chief Learning Officer Award, Asia Pacific, in the Rapid eLearning Tool category. Further, Raptivity was awarded the ‘Best Upgraded Product’ by Tech & Learning in the 30th Annual Awards of Excellence. This is a prestigious 30-year-old recognition program which recognizes outstanding educational technology products every year. The year ended by bagging the award of ‘Best Rapid eLearning Tool’ under the Best in Class Technologies group by the Africa Learning & Development Leadership Awards 2012. Remarkable achievements and worth the efforts taken by Team Raptivity. We wish to thank everybody for their support, feedback, collaboration and suggestions which came in time and made everything possible. Hope your suggestions keep coming this year as Raptivity gears up to do more in the interactivity domain. 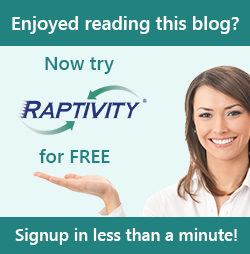 Please do feel free to share your suggestions at info@raptivity.com.